A second way of transporting barrels on the island of Madeira was by the sturdy island horse. 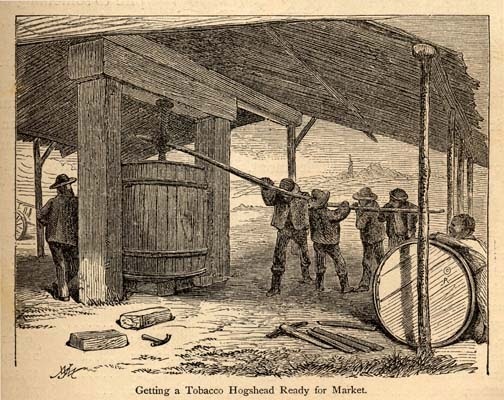 The following illustration, also from The Great South, 1875, shows how the tobacco was compressed into the huge barrel. THE MANNER OF DRAWING PIPES OF WINE ON A SLEDGE. 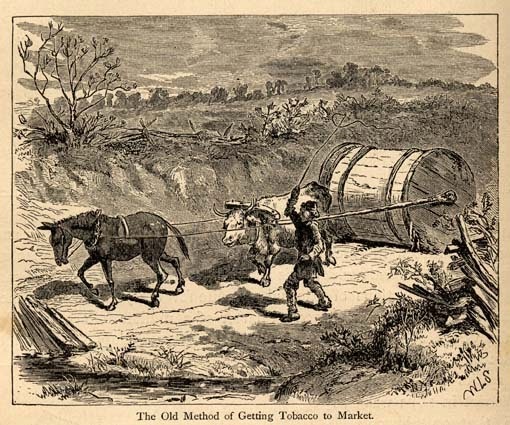 This is the usual way of transporting wine from one part of the town to the other. The coopers of Funchal are known to be excellent workmen, and the pipes made are very much admired for their perfect construction. The oxen employed on the occasion, which are natives of the island, are a very beautiful race of animals, and highly useful, both for their strength and tractable character. AFTER the wine is pressed from the grape, it is allowed to remain for a certain time in a state of fermentation, and when clear, is transported to town in barrels, carried by small ponies, a race of horses peculiar to the island of Madeira. In the same manner they carry bags of rice, flour, and baggage, of all descriptions, from the town into the country. These small horses are equally remarkable for their strength and docility, being perfectly tractable in all the various uses to which they are applied. Indeed, it is a singular faculty which they acquire, of continuing the same pace in ascending or descending the hills, over which their journeys oblige them to pass.